49 ° 00 'N, 08 ° 23' E, in SW Germany, in Baden-Württemberg, near the French-German border. Jewish population: 2.577. Pinkas HaKehilot, Germany, Vol. 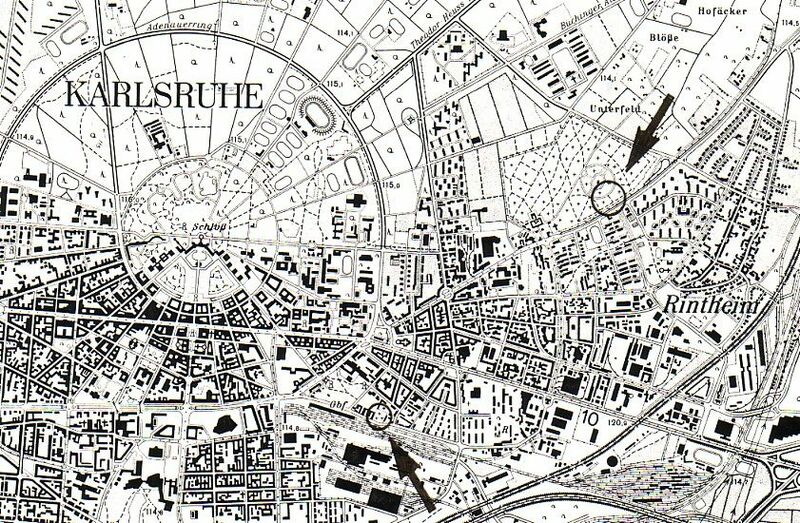 2 (1986), p. 444: "Karlsruhe"
IN USE: From 1723 until 1826. NUMBER OF GRAVESTONES: None remaining. History by Theobald 1984, pages 78-79. History in Karlsruhe 1988, pages. 262-265. In 1723 this was the 1st Jewish cemetery in Karlsruhe. It was enlarged in 1756 and again in 1794. It was finally closed for burials in 1826. From 1826 onwards burials took place at the cemetery located at the eastern part of Kriegstraße. In the 1880s the Karlsruhe City authorities attempted to do away with this cemetery on the Mendelssohnplatz to make way for housing developments, against very strong protests from the Jewish community. In 1897 the Jewish community received compensation, when the cemetery was expropriated and taken over by the City. In 1898 the remains of the graves were exhumed, with the majority being re-interred in the meanwhile closed cemetery in the (Kriegstraße). Individual gravestones were either re-erected above the new graves or, in the case of communal graves, positioned leaning against the cemetery wall. (Information from Gumprich 1898 and also Karlsruhe 1988, pages 262-265). Those remains not re-interred here were re-buried in the new orthodox cemetery at Kriegßtraße 36 (see next cemetery below). SOURCE: University of Heidelberg, Alemannia Judaica and City of Karlsruhe, Jüdische Friedhöfe. IN USE: From 1826 until 1896, when it was closed although a few individual burials took place up to and including the 1930s. 1985 photographs of all gravestones with cemetery layout by Zentralarchiv. 1989 grave register using these photographs by Zentralarchiv (ed. Andreas Gotzmann). 1995 full cemetery documentation with the use of these photographs by the State Office for Historic Monuments (Landesdenkmalamted. Barabara Döpp, Frowald GilHüttenmeister and Monika Preuß), Zentralarchiv copy: five volumes (= Karlsruhe 3, 4, 5, 6, 7 ). 1998 using the corresponding photographs, translation of 133 selected gravestone inscriptions by Andreas Gotzmann. Photographic cemetery overview by Hundsnurscher/Taddey 1968, figs. # 103 and 106. History in Karlsruhe 1988, pages 265-266. The earthly remains of the Mendelßohnplatz graves were re-interred here in 1898. Most of the gravestones were placed alongside the cemetery wall, except those of a few prominent Jews which were re-erected over individual graves. SOURCE: University of Heidelberg, Alemannia Judaica and City of Karlsruhe Jüdische Friedhöfe. 3. Orthodox Haid- und Neu-Straße 41 - 45 (Detail - arrow top right). LOCATION: The Liberal and Orthodox cemeteries are side-by-side, adjoining the Karlsruhe City general cemetery. IN USE: From 1872 until about 1940, 1971 and 1984, when it was closed although a few individual burials took place up to and including the 1930s. 1987 photographs of all gravestones (368) with cemetery layout by Zentralarchiv. 1994 full cemetery documentation with the use of these photographs by the State Office for Historic Monuments (Landesdenkmalamted. Monika Preuß). Zentralarchiv copy: two volumes (see Karlsruhe 1 and 2) . Photographic cemetery overview by Theobald 1984, page 95. History in Karlsruhe 1988, page 266. Gräber, Grüfte, Trauerstätten. Der Karlsruher Hauptfriedhof by Karl Zahn published by the Stadtarchiv Karlsruhe through Ernst Otto Bräunche, 224 pages with 30 colour and 107 black/white photographs, hard cover, ISBN 3-88190-282-1. The orthodox section of the cemetery was dedicated in 1872 by the orthodox minority of the Jewish community in Karlsruhe, having earlier separated from the rest of the community in 1869. All gravestones carry Hebrew inscriptions only. The earthly remains from the graves belonging to the Ettlinger family, exhumed from the Mendelßohnplatz cemetery, were re-interred here in graves along the rear wall of this cemetery. This cemetery is not open for visits by the general public. 4. "New Cemetery" (Liberal) Haid- und Neu-Straße 41 - 45 (Detail - arrow top right). LOCATION: The Liberal and Orthodox cemeteries are side-by-side, adjoining of the Karlsruhe City general cemetery. IN USE: dedicated in 1876 and still in use now. NUMBER OF GRAVESTONES: 1,034 in 1987. 1987 photographs of all gravestones by Zentralarchiv. 2003 full and complete cemetery documentation including the use of 157 selected gravestone photographs by the State Office for Historic Monuments (Landesdenkmalamt ed. Guido Kleinberger). This documentation includes a burial register provided by the Cemetery and Funeral Office of the City of Karlsruhe dated 19 March 2002. Zentralarchiv copy : 8 volumes (see Karlsruhe 8, 9, 10, 11, 12, 13, 14, 15 ). Numerous photographs of gravestones and various general cemetery views in Alemannia Judaica. History in Karlsruhe 1988, pages 266-270. Gräber, Grüfte, Trauerstätten. Der Karlsruher Hauptfriedhof by Karl Zahn published by the Stadtarchiv Karlsruhe edited by Ernst Otto Bräunche, 224 pages with 30 colour and 107 black/white photographs, hard cover, ISBN 3-88190-282-1. In the entrance to the mortuary are commemorative plaques in honour of the fallen WW1 soldiers of the Karlsruhe and Pforzheim Jewish communities. There is also a commemorative stone recording the names of Karlsruhe Jews who were deported and then perished during the Nazi era. Visits of this cemetery only in exceptional circumstances by permission of the Karlsruhe Jewish Community and the City's Cemetery and Burial Office. (Friedhofs- und Bestattungsamt). SOURCES: University of Heidelberg, Alemannia Judaica and City of Karlsruhe Jüdische Friedhöfe. 5. Karlsruhe - Grötzingen "Junge Hälden" Werrabronner Straße. IN USE: Dedicated around 1900/1905 until 1935 (oldest gravestone identified dated 1905). 1987 photographs of all gravestones with cemetery layout by Zentralarchiv. 1992 full cemetery documentation with the use of these photographs by the State Office for Historic Monuments (Landesdenkmalamted. Barabara Döpp. NOTE: Prior to having their own cemetery, the Jewish community in Grötzingen used the cemetery in Obergrombach for burials (Hundsnurscher/Taddey 1968, page 112).